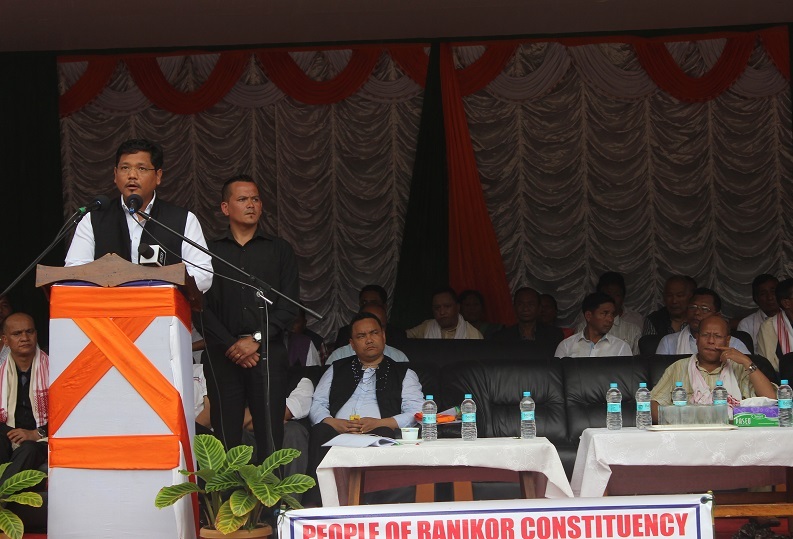 The people of Ranikor Constituency in South West Khasi Hills in Meghalaya on Tuesday withstood inclement weather to welcome State Chief Minister Conrad K Sangma, who paid his maiden visit to the area along with Deputy Chief Minister Prestone Tynsong and Cabinet colleagues Home Minister James K Sangma and C&RD Minister Sniawbhalang Dhar. At the public meeting, Conrad Sangma assured that the demand for creation of a new Ranikor Civil Sub-Division was genuine and would soon be fulfilled. “It is the long pending demand of the people and I assure that the Government has decided to consider the popular demand of the people. We will finalize the date for the inauguration of the new Civil Sub-Division at the earliest,” said the Chief Minister. During the meeting, the Congress block unit was dissolved by the president and general secretary of the Block Congress unit, who were welcomed by the State NPP president Dr W R Kharlukhi in presence of Chief Minister Conrad K Sangma, who is also the national president of NPP. Dr Kharlukhi also dissolved the NPP Block unit at Ranikor to constitute a new body at the earliest. Several leaders and Congress workers also joined NPP at the public meeting. A crowd of over 2000 was present. Sitting Congress MLA Martin Danggo, who hosted the public meeting on behalf of the people of Ranikor Constituency, expressed his confidence in the leadership of Conrad K Sangma and said that he foresee a brighter future for Meghalaya under his able and dynamic leadership. “I am thankful to the Chief Minister for his assurance to accept our memorandum and demands. I assure him that I will resign from Congress party as and when the date for the inauguration of the new Civil Sub-Division is made by the Chief Minister,” said Martin Danggo, who sought people’s advise to be part in his new endeavour. The Congress flag was put down by the Congress president and general secretary, who resigned to join the National People’s Party and hoisted the National People’s Party (NPP) flag before a large gathering, who withstood rains to be part of the history event, wherein large number of Congress supporters and party workers have decided to join the NPP. 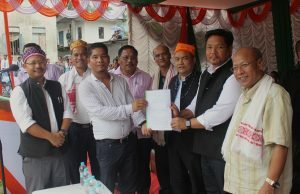 Others who attended the programme were Mawkyrwat MLA Remington Lyngdoh, Siju Rongra MLA Rakkam Sangma, Williamnagar MLA Marcus Marak, Mawshynrut MLA Gigur Myntrong and NPP state president Dr W R Kharlukhi. People of Ranikor constituency welcomed the Chief Minister at three different locations amidst joy for his maiden visit to the area.